I’ve heard the lament from quite a number of you: you bought a lovely journal, and you think the activities I’ve been posting look really fun and interesting, but you are too busy to journal right now. Maybe later, when life calms down a bit . . . I don’t know about you, but that magical “later”, when things are calm and I have all sorts of free time never seems to show up in my life! Instead, I had to learn to journal “in the midst of things” (as well-known creativity coach Eric Maisel calls it). I struggled to establish an ongoing journaling practice. I would start off well, kept my journal for a few weeks or maybe months, and then, life got in the way and I didn’t journal at all for a month. I would conclude I just didn’t have the discipline—or the time—to journal. I gave up journaling many times! But, something kept drawing me back. Something told me I needed to give my heart, mind and spirit more creative nourishment. Just as something is calling to you, if you’re reading these posts and have a lovely journal you wish you had time to work in. My life is no less busy than it ever was, but I have finally found a way to have my journaling practice be an ongoing part of my life—and my life is much richer for it! I made it work by making my journaling practice fit my life, instead of waiting for my life to fit my journaling practice. That meant giving up a lot of ideas about what journaling is, or should be. It also meant finding ways to fit my journaling into little pockets of time. It meant making journaling so ridiculously easy that I found myself doing it even when I thought I didn’t have time. It also meant sometimes paring down my practice so that all I needed was a tiny journal and pen that I could carry everywhere. It meant finally understanding that my ultimate goal in Creative Energy Journaling is to practice being in the creative “flow”. My journal is for mind-wandering and daydreaming. For reviving and restoring my creative energy. It doesn’t really matter much what activity I use. What matters is giving myself permission to spend time “doing nothing”, so my brain can do the important task of taking a giant step back and getting the big picture, of seeing subtle details and unusual connections that lead to creative new ideas. Even those of us who work in creative fields, doing creative tasks, sometimes get so goal-oriented that we don’t give ourselves enough time for this. But, before I found a way to make journaling an ongoing part of my life, I made a lot of mistakes. So, this post is the “don’t make the mistakes I made!” post. Don’t buy a too-lovely journal. Oh, how I love books! Oh, how I love beautiful, heavy paper and sewn bindings! I have long ago lost track of how many journals I’ve bought that were too beautiful to actually work in. I did eventually work in most of them. Until I put something down that was ugly or amateurish or otherwise didn’t seem to be worthy of the beautiful journal I was using. After that, each time I’d open my journal, I’d feel bad about that page. Or I wouldn’t even open my journal because I didn’t want to see that page. I stopped journaling more than once for this (admittedly silly!) reason. I can’t tell you what “too lovely” is for you. But you’ll know right away if you’ve bought a too-lovely journal. That’s the one that you have a hard time working in unless you’re feeling super-creative and energetic. Because, of course, you can’t just put any ugly, deformed thing on those beautiful pages. You need to take some care and think about it! If this has happened to you, tuck that journal away somewhere and go get one that isn’t so beautiful! Not only did I buy lovely journals, I stored them neatly on a bookshelf, so they wouldn’t get beat up. When I started adding visual elements to my journal, I neatly organized all my journaling supplies in a cabinet. In order to journal, I had to go get my journal, then go get all the supplies I would need. Then find a place to work. But, oh, wait . . . I had to also decide if I was going to do something messy, or if I could curl up in bed with my journal and some colored pencils. Just thinking about all that made me tired! Or, put all your journaling supplies in a tote that you can easily pick up and carry to wherever you feel like journaling. My super-duper journaling tote, straight from the toolbag section of Menards. Or, pick one or two simple, non-messy activities and let most of your journaling be those few things. (I know I’m part of the problem here, distracting you with new activities each week!) In the beginning, almost all of my journaling was blind contour drawing and doodling. Even now, a lot of my journaling is basically that sort of thing, although I’m often embellishing or developing something I started earlier. If you can’t keep your journal out, put it someplace where you will run into it at an opportune time. Next to your coffee mug, on top of your pajamas, in your lunch tote, in your briefcase or purse. Let go of thinking that you have to put something on the page. I used to feel bad when I realized that “yet another week has gone by and I haven’t even opened my journal!” Or, I would open it, but all I would do is leaf through it and feel bad that I didn’t have the creative juice to actually put something on the page. I would still feel bad that I hadn’t “done something”. But I had! It took me a long time to realize that simply leafing through my journal, browsing journaling ideas and activities, and handling my supplies still allowed my brain to slip over to “creative mode” for a little while. Looking, touching, sensing and not doing is also part of the journaling process. You are still giving your brain the break it needs from task-oriented, time-pressured situations and opening the door to the kind of wandering, undirected thinking that allows barely-glimpsed ideas and tenuous connections to emerge into consciousness.. Simply handling colorful supplies and seeing colorful examples (yours or others’) stimulates your senses, opens your thinking to possibility and helps you shift into a more creative mindset. So, instead of feeling bad about “not doing something”, remind yourself that a big part of restoring your creative energy requires exactly that, and give yourself permission to “be, not do” for a few minutes. Let go of the idea that you need a big chunk of time or a special place. Some of the artwork I do professionally does require a big chunk of time, because it’s involved to set up and clean up. I have to resist the temptation to think about my journaling this way! Creative energy journaling is about keeping your creative energy flowing when you can’t find a big chunk of time, or don’t have access to a lot of space and supplies. 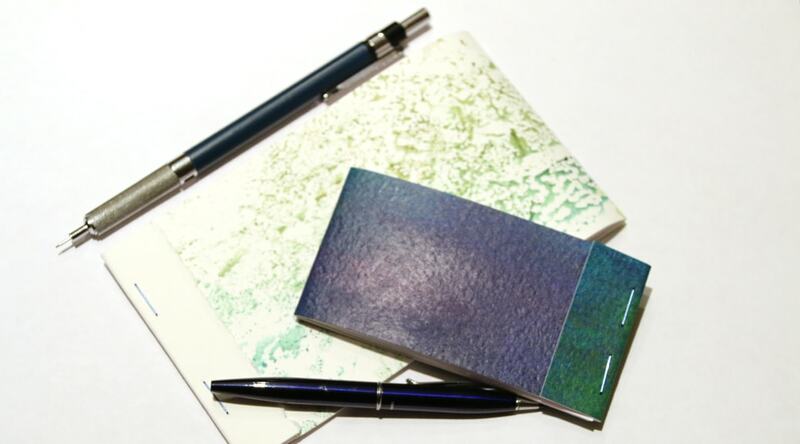 Creative energy journaling is designed to fit into little pockets of time! And to be something you can pick up and put down. Something you can do like mad for three days and then not come back to for a month. It doesn’t matter! So what if you don’t feel like continuing on the page you were working on? Work somewhere else! Combine your journaling with something already on your schedule (morning coffee, TV watching, waiting for your kids, lunch break). Better yet, combine it with whatever’s getting in the way (take your journal to appointments, bring a second journal or pad and markers or pencils to share when you go to visit an elderly parent, do it with your kids or grandkids). A Mighty Tiny Matchbook Journal! Takes no time to make, smaller than a cellphone. I call it my Mighty Tiny Matchbook Journal. Smaller than a cellphone, so I can take it anywhere, and work it in totally unobtrusively (people think I’m making to-do lists!). I can (and do) add color later, when I’m home with my colored pencils, markers and watercolors. What it looks like opened up. To make one, simply cut up some copy or printer paper to the size you want (you can also use paper from a small notepad). Cut a piece of heavier paper or card stock (scavenge!) long enough to wrap all the way around, plus a little. Fold over one end and staple, leaving a little bit free so you can tuck the other end under, just like the cover on a matchbook. That’s all there is to it! Stop trying to make it look cool. I like to post images of things that look interesting, hoping they’ll entice you to try the activities, but I know for some people, that backfires. Oh, I know how it goes: you really want to try the activities! But you don’t get started because it would take too much time and effort to make something that looks that cool. The point is to give yourself a chance to spend time in an open-ended, wandering frame of mind, not to make something pretty. Don’t wait until all your to-do’s are done. Do you tell yourself you’ll sit down and journal . . . just as soon as you finish all your to-do’s for the day? You do realize how that’s really going to go most of the time, don’t you? Instead of viewing your journaling practice as a reward at the end of the day for getting all your work done, use it as a way to restore your energy so you are able to get your work done more efficiently. Use it like a coffee break (or during a coffee break) or a mental “stretch break”. Put down your devices and get offline, and pick up your journal instead. Those times you take a break from a demanding task, and succumb to the temptation to browse Facebook? You’re not slacking! (Really!) At least, the impulse that nudges you to start is a healthy, natural response to the need to have a period of unfocused mind-wandering after a period of mentally demanding work. Next time, try pulling out your journal instead. Make a Mighty Tiny Matchbook Journal and tuck it in with your phone, where you’ll be reminded of a more creative alternative the next time your brain needs to shift gears. I promise your brain (and heart and spirit) will thank you!